1. Do you have a Customer Satisfaction policy? 2. Do you ship to Alaska, Hawaii, APO addresses, or outside of the United States? 3. How does the Shopping Cart work? 5. Can I order by mail using a personal check? 6. Do you have a toll-free telephone number? 8. What if my glass is damaged in shipping? 9. What do you charge for custom work? 10. Do you build church windows? 11. Do you build insulated or double-pane windows? 12. What are "bevels" and "bevel clusters"? 13. What can you tell me about stained glass care and safety? 14. What is "Tiffany" stained glass, and do you sell it? 15. What is "leaded glass", and is it the same as "stained glass"? 16. How can I be sure the glass I order will fit? 17. Do you do etching or engraving on glass? 18. Why is stained glass so expensive? Yes! Our policy is simple: when you do business with Treasures of Light, your satisfaction is guaranteed. If you are not satisfied with the goods or service you have received, or if you have a question, please let us know by using our Contact Us page. Your feedback is very important to us. It helps us to improve our business and serve you better. Do you ship to Alaska, Hawaii, APO addresses, or outside of the United States? Absolutely! APO addresses are considered domestic, so there are no special ordering procedures. For all destinations outside the continental U.S., including Hawaii and Alaska, please visit our How to Order page. By clicking on 'View Cart' you'll be taken to your shopping cart. As you browse through our merchandise, you can place items in your cart by selecting the 'Add to Cart' button from the product. Your choices will be calculated in the cart, giving you an up-to-date subtotal of your order. To change quantities of the items in your shopping cart, simply enter the appropriate quantity in the 'Quantity' box and click 'Update Cart' button. To remove an item, you put a check in the 'Remove' box next to that item, then hit the 'Update Cart' button. When you are ready to check out, click the 'Proceed to Checkout' button. How does a Secure Site work? In plain English here's what happens when you place an order. First, you'll notice that you enter a secure site (such as the PayPal Shopping Cart window) when a padlock icon appears in the status bar of your browser (usually at the bottom). This states that all of the information passing between your computer and PayPal will be encrypted. PayPal will tell your computer how to encrypt all information passed over the line using encryption that can only be decoded on the PayPal server. Your computer will encrypt before sending any information onto the cable or phone wire, out onto the Internet, and eventually to PayPal. When it reaches PayPal, it will be decoded and logged to the purchase database for processing. Without the decoding key located on the PayPal server, it is virtually impossible to decipher the encrypted data. Can I order by mail using a personal check? Yes, although you may not find it as convenient as ordering online. Make out your check to Treasures of Light for the total amount of your order, including shipping. Shipping fees for each piece are displayed directly below the price. There is no shipping charge for gift certificates. If you live in Maryland, you must add 6% state sales tax to the total amount of your order including the shipping charges. We do not charge sales tax to residents of other states. Along with your check, provide the Quantity, Stock Number, and Description (name) of each item you are ordering. We will also need your full shipping address including zip code and telephone number (some shipping services require the phone number). Also include your e-mail address if you would like to receive a confirmation of your order and shipment. When your order and check arrive, we will ship the merchandise and notify you via e-mail (if you included your e-mail address). Of course, if you are purchasing a made-to-order item from our Tailor Shop, it will be shipped upon completion. We accept starter checks and counter checks, however there will be an additional delay of 10 business days from the time we receive the check until we can ship your merchandise, to allow the check to clear. Treasures of Light charges the customer a $25.00 fee for any check returned by a bank as non-payable. This is in addition to any fees your bank may charge you for the returned check. Do you have a toll-free telephone number? Yes, we have a toll-free number! Call this number to speak with Customer Service if you have any questions, or if you wish to discuss a custom order. Although we can take orders over the phone, you will still need to pay securely online or (if you prefer) mail us a check. Custom Orders, including design changes, may take longer. Our current waiting list is three to six weeks, which is counted from the time we begin construction (when you are fully satisfied with the design). Shipping Time varies depending on where you live. Standard Shipping (Parcel Post) usually takes 7-10 postal business days. Shipping outside the continental USA may take longer. All our merchandise is sent Standard Shipping unless otherwise stated. We accept starter checks and counter checks, however there will be an additional delay of 10 business days from the time we receive the check until we can ship your merchandise, to allow the check to clear. When we ship your package(s), we send you an e-mail confirming the shipment. This e-mail includes a tracking number and instructions for tracking the package with the U.S.Postal Service. If you misplace the tracking number, please contact us with your order number and we will send you the tracking number. What if my glass is damaged in shipping? No problem! All shipments from Treasures of Light are fully insured. To receive credit for the damaged shipment, you must contact us within 2 days of delivery. This is an insurance requirement. Visit our Contact Us page and choose Damaged Shipment Report as your subject line. Describe which piece(s) are damaged, and provide the order number, your telephone number, and what time of day is best for us to call you. A customer service representative will contact you as soon as possible to arrange for repair or replacement of your merchandise. We will do our best to replace your glass quickly, however, if an exact replacement item is not in stock, there may be a delay while we have the replacement piece made. Custom Design Fee is normally $50, which covers our time working with you to achieve the design pattern and choose the glass colors you like. This fee is non-refundable, and is generally required before we get started on design. Materials Fee is 30¢/square inch. This covers glass, solder, and all the other materials that go into your piece. For a 12" x 36" piece, for example, this works out to $129.60. Labor Fee depends on the number of individual pieces of glass in the pattern you choose. This is where your design choice can save money. Figure $1.75 per piece (for projects under 680 sq. in.). This fee covers the craftsmanship and effort that goes into assembling your stained glass. For example, if you were to choose a design with 50 individual pieces, labor would be $87.50. Very large hanging panels or windows may be subject to a slightly higher fee structure. They may also incur certain charges for reinforcing rod, heavy duty zinc framing, etc. Shipping depends on the final size and weight of your merchandise, and the state to which it is being shipped. A good rule of thumb is to multiply your square inches by 7%. In the example above, that comes out to $30.24. We do not make any profit on shipping costs--that is what it costs us to get the glass to you safely and in the proper packaging. Although only very large items require crating, all stained glass must be packed in heavy duty cardboard shipping boxes, with bubble wrap, packing "peanuts", and other high-quality packing materials. If your shipping address is Maryland, 6% state sales tax gets added to the total cost including shipping. Otherwise, you pay no sales tax. Do you build church windows? If you are located on the East Coast, by far your best choice is Timeless Tiffany, Inc., located in Elkton, Maryland. They specialize in church windows. Ask for Barry Chidester; the telephone number is (410) 398-6604. There are others you can find if you hit some of the major search engines such as Google. Whenever a construction project is involved, such as church windows, be sure to deal with a company that has adequate licensing and insurance. Do you build insulated or double-pane windows? When building a decorative stained glass panel, it is rarely advisable to build it into a weatherproof window except in the case of a large project such as church window restoration, where cost is no problem. Unless you use special - and expensive - construction methods, the window will not have the same insulating qualities and weatherproof integrity of commercial windows such as Pella or Andersen. Your leaded seams would also be exposed to the elements, and they tend to collect dirt. Your windows would be more difficult to clean, especially from the outside. The usual solution is first to purchase your double-pane window from a reputable window company. Then measure your window frame's inner dimensions JUST INSIDE the existing glass. We will build your stained glass panel to fit that inner dimension. You will install the panel up against the existing glass, on the inside of the house. You secure the stained glass in place with glazier's points (from your local hardware store). This makes it easy to remove for cleaning, or if you wish to "rotate" the panel to a different window location for variety. Another popular installation method is wood molding; however, this tends to be more permanent. What are "bevels" and "bevel clusters"? Bevels are shaped and faceted pieces of clear glass. A bevel cluster is a set of these bevels arranged in a group. Click here to see our Crystal Palace series, which features a large central bevel cluster. What can you tell me about stained glass care and safety? Click here for our Stained Glass Care and Safety Guide. What is "Tiffany" stained glass, and do you sell it? The "Tiffany Method" of building stained glass was introduced at the end of the 19th century by Louis Comfort Tiffany, famous artist and glass designer. Glass shapes are cut and ground. The edges of each piece of glass are covered in copper foil, then the pieces are connected by running a bead of molten solder over the copper foiled seams. The Tiffany Method is used to create 3-dimensional objects such as lamp shades, as well as decorative stained glass panels. All stained glass offered for sale on our web site, unless otherwise noted, is built using the Tiffany Method. Scroll to the top of this page and click on the menu links (Express Shop, Tailor Shop, and Dream Shop) to see what we have for you! What is "leaded glass", and is it the same as "stained glass"? These terms are often used interchangeably; however, leaded glass properly refers to a specific technique for constructing stained glass panels or windows. This method is quite like a jigsaw puzzle. Glass is cut to individual shapes which fit together to form a pattern or picture. Lead cames (channeled lead strips produced for this purpose) are then used to join the pieces of glass to form a panel. Where the lead meets, solder is applied. The panel is then weatherproofed with a lead sealant cement and finished with polish. Leaded glass is still the most popular method of creating large windows, particularly if they are for exterior exposure and need to be weather-tight. For general artistic and decorative work, however, the lead came method has lost popularity to the more versatile and aesthetically pleasing Tiffany Method (see previous question). How can I be sure the glass I order will fit? If you are purchasing any type of stained glass panel for installation in an existing space, such as a window frame or cabinet, you must measure the opening carefully. Find the smallest measurement in each dimension, because some windows (especially on older houses) may be slightly uneven. 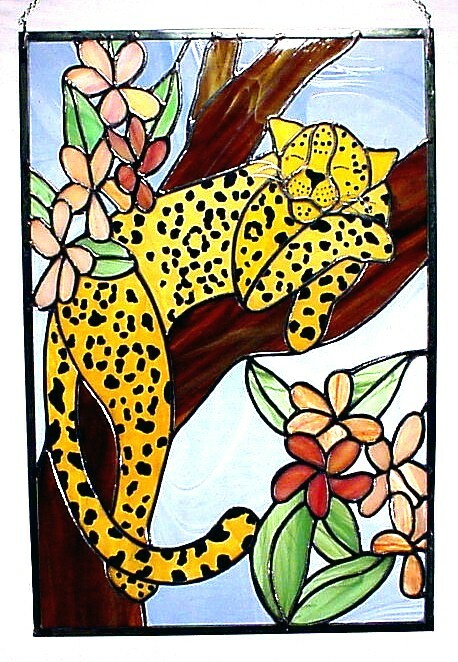 We will construct your stained glass panel to be about 1/8" smaller in each dimension to ensure a good fit. 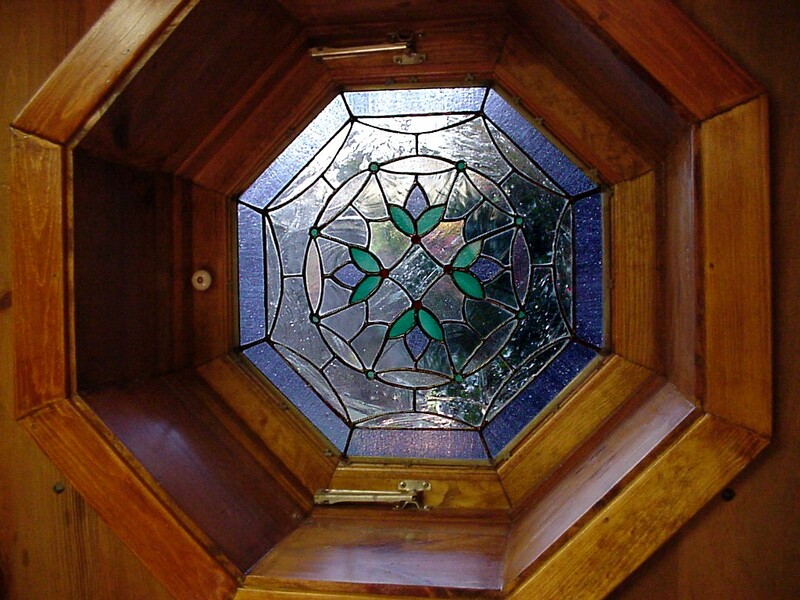 Install the stained glass with your choice of fasteners, such as glazier's points or wooden molding. We also recommend a thin bead of silicone caulk, but do not caulk all the way around. Leave gaps in the caulk bead to allow moisture and heat to escape. Do you do etching or engraving on glass? What we do is known as ENGRAVING. It is accomplished with small power tools that drill or grind away the surface of the glass. The ground areas are usually filled with a lacquer-based paint so they show up better against the light. This procedure is best suited for small decorations or a limited amount of lettering; otherwise it can become quite expensive because of the labor time involved. Full-size pictures or large amounts of lettering (e.g., glass award plaques) are best accomplished with an ETCHING process. This can be either a chemical or physical (sandblasting) technique, and is exponentially faster to perform. 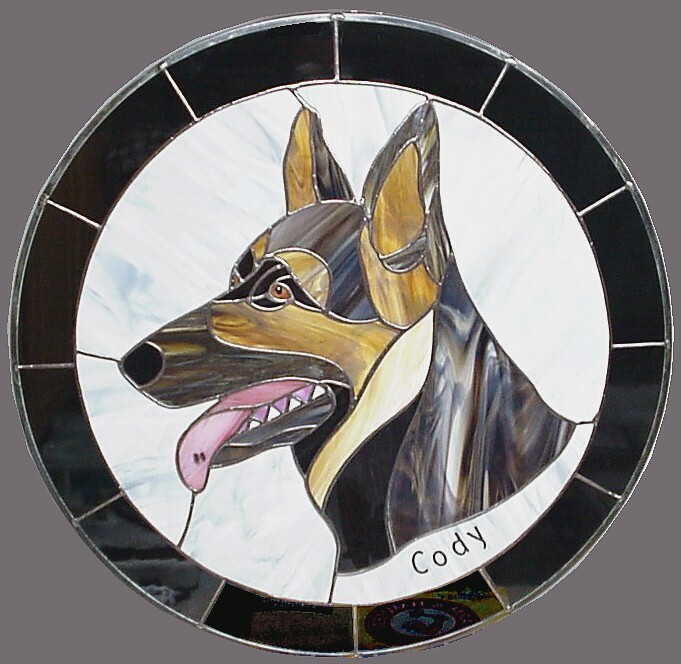 Glass etching is a specialty that is not offered by most stained glass companies. If you contact a company that specializes in custom ETCHING on glass (see some names below), then you stand a better chance of affording the price tag for a large project of this type. These companies have pre-cut clear glass blanks for trophies and awards. However, if you would like etching on stained glass, we can build the piece for you, and you can then have it custom etched by the etching company of your choice. You can find more choices by going to a good search engine, such as Google and typing "custom glass etching" in the "Search" field. Why is stained glass so expensive? There are several reasons why stained glass is "expensive." Cost of materials varies greatly from one manufacturer to the next; it also varies depending on color and texture. Some glass may cost $4-6 per square foot (Glue Chip, or Spectrum WaterGlass), while some can be as much as $15-25 per square foot (e.g., Uruboros fracture glass). The price depends on the materials and labor involved in producing a certain type of glass. For example, did you know that 24K gold is used to achieve the color in most red glass? Stained glass art involves skilled craftsmanship. It takes years of patience and practice to produce high quality work. Each manufacturer's glass has unique quailities and behaviors, as well as colors and texture. A craftsman must become familiar with all the available materials and know how to combine and orchestrate them into a work of artistic merit. Building a stained glass panel is like creating a jigsaw puzzle. Each piece of glass must be designed, cut, ground, and fit together to achieve the final image. Tolerance between the pieces of glass is usually about 1/32nd of an inch; otherwise the seams will be uneven. Glass is an unforgiving medium. It wants to break in straight lines, so achieving a circle or curve requires a series of straight cuts, usually followed by grinding and polishing. Some designs with small, intricate seam lines require the use of a special band saw. Of course, not all types of glass take kindly to the heat and vibration of a saw, so there can be a lot of breakage and waste. Add to all this the cost of bandages, aspirin, and sanity therapies! But of course, stained glass--the final product--is unrivaled in the beauty and atmosphere it adds to your home or office.